Behaviors used to contain a Flow diagram as a root box type, now it can also contain directly a Timeline. The Root box type is now requested when creating a new Behavior. If the field “Behavior can be run on charging station” is not checked, you will not be able to launch the Behavior while the robot is on his Charging station. A new field has been added to choose whether an Activity may start on user request. For further details, see: Behavior property list. 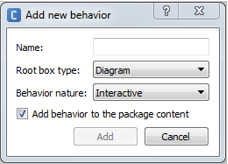 Project objects panel shows the complete boxes tree of the current Behavior. It eases the navigation from a box level to another, and also provides a search field to find boxes by name. For further details, see: Project objects panel. Active content panel lists running Behaviors, Services and Dialog topics. It gives the possibility to stop and restart them, and keeps a brief history of the last active contents. For further details, see: Active Content panel. Inspector panel gives a centralized view of main objects in Choregraphe: Behaviors, Boxes in the diagram and in box library, applications. Note: The Limb properties also appears in the inspector. Note: if you select a pure animation box, the Inspector shows a 3D preview of the animation. For further details, see: Inspector panel. box properties are now displayed through the Inspector panel. Robot applications now displays Behaviors, Dialogs and Services. Clearer Behavior loading indication bar. When linking boxes, inputs and outputs names are displayed. Trigger conditions edition offers auto-completion, syntax highlighting and syntax checking. New languages are supported in the Dialog. For further details, see: Supported languages. Choice boxes are much more efficient and are compatible with dialogs, you are encouraged to replace them!